Many patients experience some level of fear or apprehension at the thought of undergoing a dental exam. This anxiety is often heightened when patients undergo more invasive dental treatments, such as oral surgery. 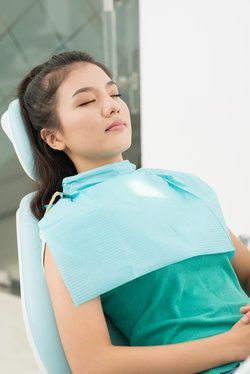 To alleviate patient fears about oral surgery procedures, such as the placement of dental implants and wisdom teeth removal, surgeons can offer sedation dentistry. At the Cocoa and Melbourne practice of Doctors Gerald W. Bird and Jay A. Johnson, IV sedation dentistry offers many benefits to patients. IV sedation can make patients feel completely comfortable during treatment. How Is IV Sedation Administered? IV sedation is administered through a needle that is placed in the arm or hand. The delivery of the medication directly into the bloodstream causes its effects to be felt almost immediately. During treatment, the surgeon can increase or decrease the level of sedation as needed. What Are the Effects of Treatment? The sedative used in IV sedation does not dull the senses, but it does induce a deep state of relaxation. Patients will be awake during treatment, and retain the ability to respond to the surgeon’s instructions during surgery. In many cases, patients do not have any memories of the procedure once they come out of treatment. The use of IV sedation makes the patient more comfortable, and makes it easier for the dentist to complete treatment. Because the patient is so relaxed, yet still able to respond to simple commands, the dentist can finish treatment in a more efficient manner, resulting in shorter overall treatment time. Patients will be instructed to have a family member or friend drive them home from the oral surgery appointment. It is not safe to drive or use heavy machinery after IV sedation. Upon returning home from treatment, patients should go to sleep and take a nap. Patients are also encouraged to drink plenty of water to flush the system of the IV sedation medication. In some cases, patients may experience some nausea after treatment. This should go away in a few hours. Taking a nap and drinking ginger ale can reduce nausea. When Is IV Sedation Administered? If you need to undergo oral surgery, IV sedation can make the experience far more pleasant than alternative forms of anesthesia. To schedule an appointment about surgery, contact the practice of Doctors Gerald W. Bird and Jay A. Johnson.